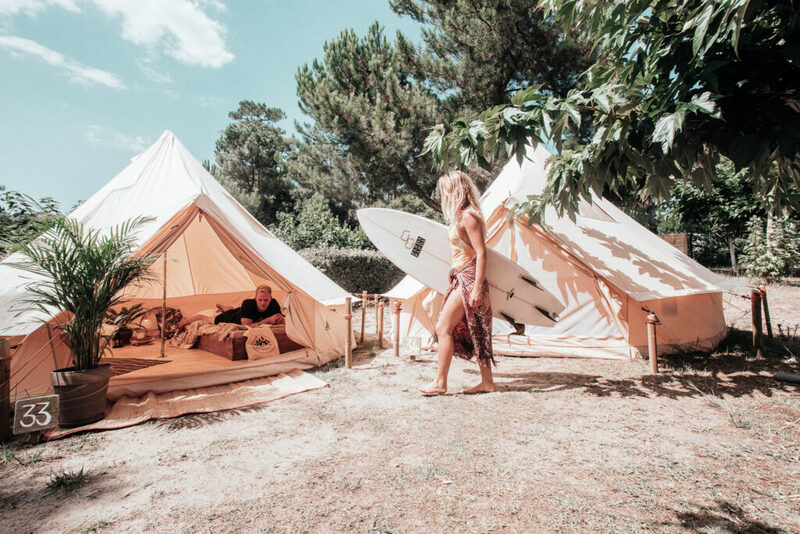 Surfing, yoga, beach games, day trips to San Sebastian and Biarritz, traditional Wine & Cheese nights, open-air surf movies, good food, great atmosphere and even better company! Here’s what’s life is like in our Moliets Surf & Yoga Camp! ... with some morning stretches and a hearty breakfast! 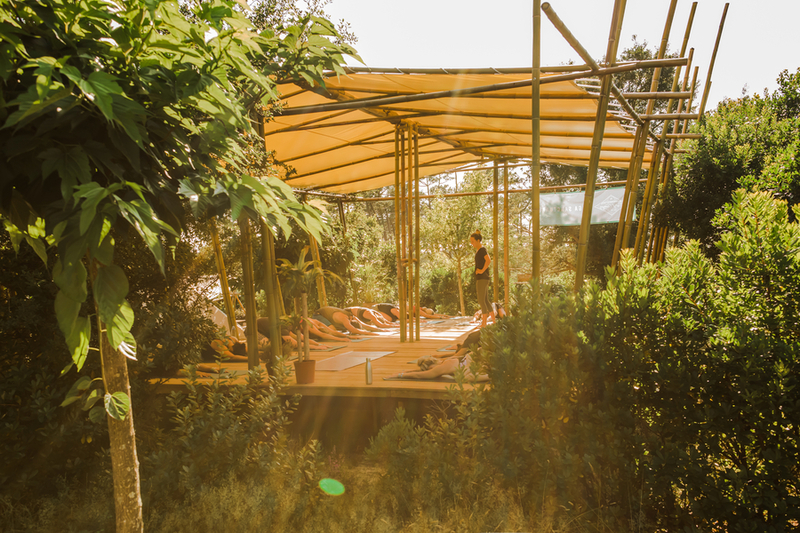 In our Molites Surf & Yoga Camp, you wake up in one of our lovely tipi tents and, with Apollo’s goodwill, are greeted with a beautiful French sunrise over the pine trees surrounding our surf camp. All early risers are invited to join our yoga instructors for a 60-minute morning session on our wooden yoga platforms. Morning yoga in the Moliets Surf & Yoga camp is aimed at waking up your body with gentle stretching and breathing exercises, preparing you for an active day ahead surfing and on the beach. 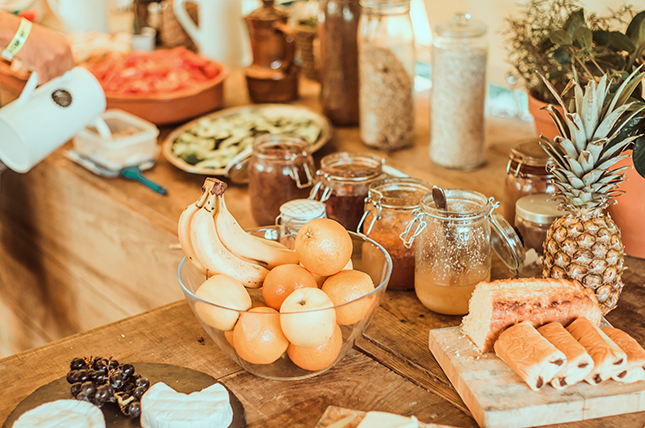 For your surf camp breakfasts, we offer hearty buffets with selections of teas, coffee, juices, milks, cereals, honey, jams, traditional French baguette, a variety of cheeses, cold meats and spreads together with fresh fruits and daily baked treat specials, such as croissants and sweet or savoury crêpes. The lovely warm French bread and plenty of veggie, vegan or meat fillings also make for the perfect picnic lunch for your day out surfing! ... when Everybody's gone Surfin'! You’ll be spending most of your surf camp day by the beach. Ahhhh, bliss! Kick back with that book that’s been gathering dust on your shelf for way too long or simply relax, have a snooze and let the French sun do that hard tanning work for you. And, of course, SURF! Beach time is always that little bit better when there’s surfing involved. In our Moliets Surf & Yoga Camps, your surf lesson times for the entire week can be found on our surf camp notice board from when you arrive in the surf camp on Saturday. So, after breakfast, double check when you’re up, grab your wetsuit and surfboard and head down to the beach. As with all sports, preparation is key. That’s why each of your surf lessons starts with a warm-up, often a fun game that gets your blood pumping before heading into the surf. Our surf lessons also cover some “surf theory” as we like to call it. Besides some fun insights into surf etiquette and slang, you’ll also learn about the intricacies of rip currents, wave formation and water safety. Once suited up, it’s time to head into the water and catch some waves. Our surf instructors are with you in the water, giving you tips on technique and catching waves. The maximum group size of each surf lesson is eight surfers per one instructor. All our surf instructors are experienced, fully licensed and qualified and also have a lifeguard qualification. After your surf lesson, it’s time to go back to that all important relaxing and tanning on the beach. And everyone with more energy, grab a surfboard to get some more practice in or join us for some beach volleyball or other beach games! ... making the most of your bohemian surroundings! 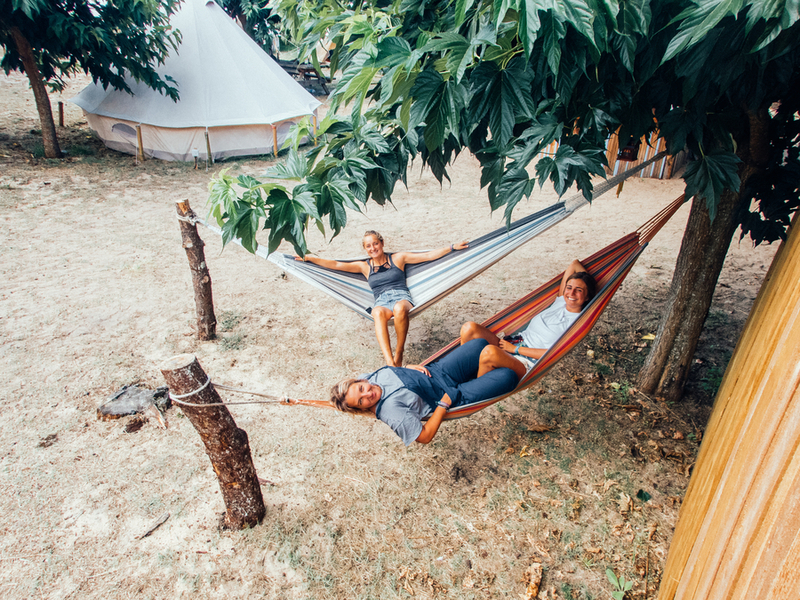 Back at the surf camp, enjoy the late afternoon sun with a cuppa and relax in the hammocks. There’s also plenty of surf camp equipment, such as balance trainers or table tennis, to keep you entertained. Our calm and relaxing afternoon yoga sessions also offer a great way to unwind after a day surfing. Here, our yoga instructors will take you through some surf specific stretches to help reduce aches and soreness. On four nights of your week in our Molites Surf & Yoga Camp, all surf camp guests and team come together to eat and to share surf stories. Expect a relaxed atmosphere of chatter, laughter and summer vibes. Dinners include veggie, vegan and meat options to suit every surf camp traveller. On a fifth evening, we celebrate the French culture with our traditional Wine & Cheese night — definitely one of our surf camp week highlights. And a week of camping simply wouldn’t be complete without an evening of getting the coals burning and the summer vibes flowing for a surf camp BBQ. Twice a week, we also take you away from the surf camp to two of Europe’s most famous culinary cities; to Biarritz where you have the chance to enjoy some traditional french cuisine and to San Sebastián for Spanish tapas and Basque pintxos. Both day trips are among the social highlights of our surf camp weeks here in Moliets and not to be missed. In our Moliets Surf & Yoga Camp, we like to keep our evenings very relaxed with a glass of wine over a surf movie or a few cocktails in one of Moliets’ local bars. 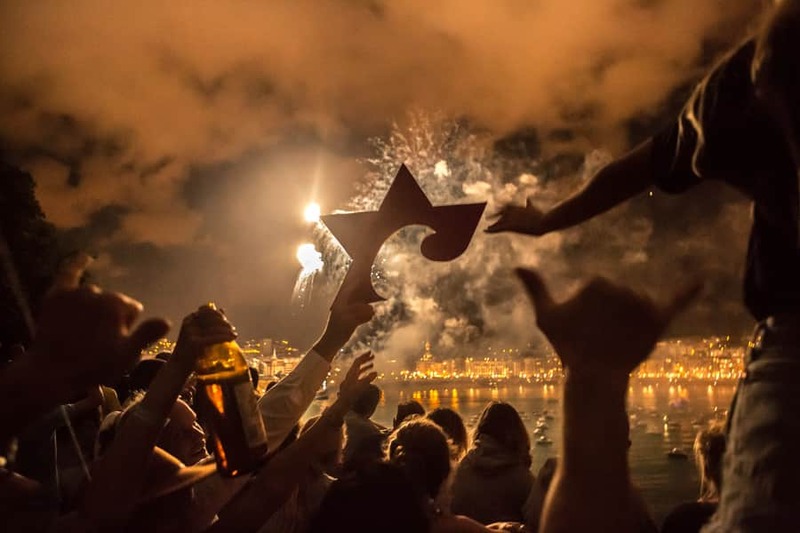 When out and about in Biarritz and San Sebastián for our day trips, you’ll also have the opportunity to experience both France and Spain’s lively nightlife. And our classic Moliets Surf Camp which is only a short walk away, offers a weekly entertainment schedule you are welcome to join in at any point. With ping pong tournaments, skate competitions, flunky ball and live music gigs, you can turn night into day if you fancy it. 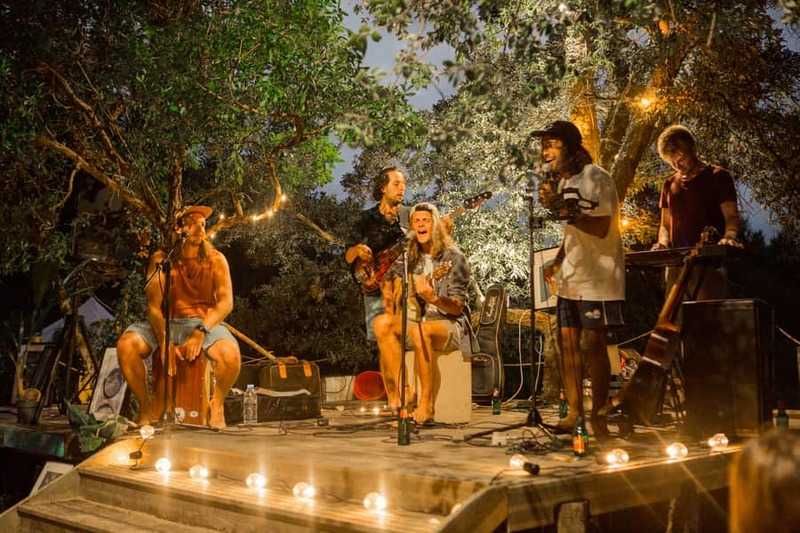 The beauty of our Moliets Surf & Yoga Camp is that the choice of entertainment is yours! If you have questions about one of our surf holiday destinations or surf camp packages, you can pick up the phone to call or WhatsApp us, send us a message on our live chat, Facebook messenger, Instagram or Email. We look forward to surfing with you!